US Defense Secretary Hagel announced that US intelligence believes it to be likely that Syria has used chemical warfare, specifically sarin gas. 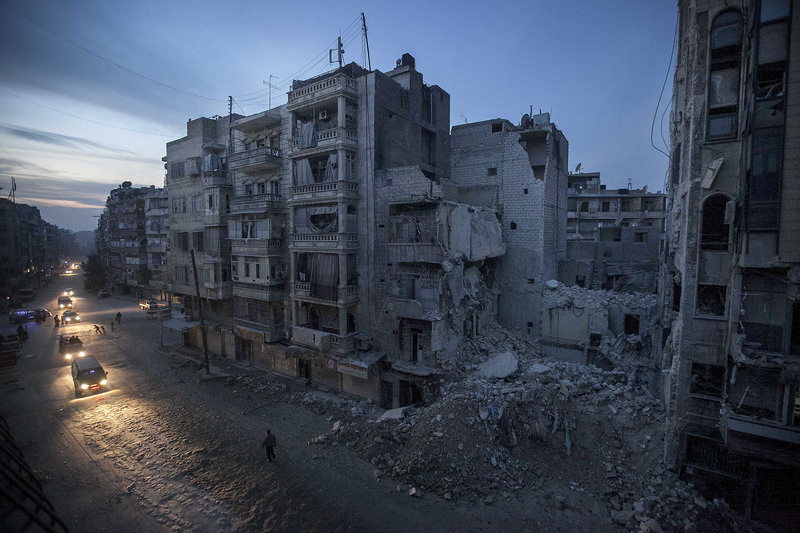 On Sunday, 566 people were found dead in Syria, having been killed over the previous six day period. According to the opposition group Local Coordination Committees, that is the highest number of dead found on a single day since the war began two years ago. 2 kidnapped Syrian bishops remain missing. The Kurdistan Workers’ Party (PKK) will withdraw from Turkey. A car bomb exploded outside the French embassy in Libya this week, destroying about half of the embassy. Two guards were injured, but most employees had not arrived yet. 185 people in a fishing community in the northeast of Nigeria were killed during fighting between extremists and government forces. The Security Council has approved the creation of a peacekeeping force in Mali. Sudanese Darfur war crimes suspect Saleh Muhammad Jerbo Janus was killed in fighting in the region this week. Sudan and the Sudan People’s Liberation Army have been brought together for peace talks for the first time. Jeremy Scahill, author of the new book Dirty Wars, on the killing of Anwar al-Awlaki (and his son). The Senate Judiciary Committee heard testimony on drones from a Yemen with experience having drone strikes hit close to home. Jordan and the UK have signed a mutual assistance treaty that will allow the UK to deport Abu Qatada. Iraqi soldiers opened fire on gunmen from helicopters this week, part of an escalation of violence in the country that has many worried. According to a recent report from an NGO, Taliban violence in Afghanistan is up sharply for the first quarter of 2013. Pakistan’s Federal Investigation Agency has formally arrested former President Pervez Musharraf for his role in the 2007 assassination of Benazir Bhutto. Pakistan’s Supreme Court made public a list of journalists who allegedly received money from a secret government fund. The Taliban’s election-related violence could have serious impact on the kind of people elected to office in Pakistan’s northwest regions. Spain is currently holding two suspects believed to be part of Al Qaeda in the Maghreb. Serbia’s president has issued an apology for Srebrenica and “all crimes” committed by Serbia during the disintegration of the former Yugoslavia. As news of Guantanamo hunger striking reveals the extent of the protest, Sen. Feinstein urges White House review of the 86 detainees cleared for release and a search for where to relocate them. The RCMP arrested two people for an Al Qaeda-linked plot to derail a Via Rail train on the Toronto-NY route. Law enforcement believes the Tsarnaev brothers to have been planning further attacks. Read about the criminal charges and first-round court proceedings for Dzokhar Tsarnaev from this Monday. Further information has come out regarding the process of the investigation and how events unfolded during the manhunt: read here, here, and here. The DC Circuit Court voted on Tuesday to review Congressional power to create new war crimes that apply to crimes committed prior to the existence of those laws. Whichever way the Circuit Court goes, the ruling is likely to be challenged at the Supreme Court. Paul Curtis was freed after charges against him in the ricin letter cases were dropped. At GQ, Nate Penn challenges arguments against women in combat by relaying stories from women who have served, in their own words. 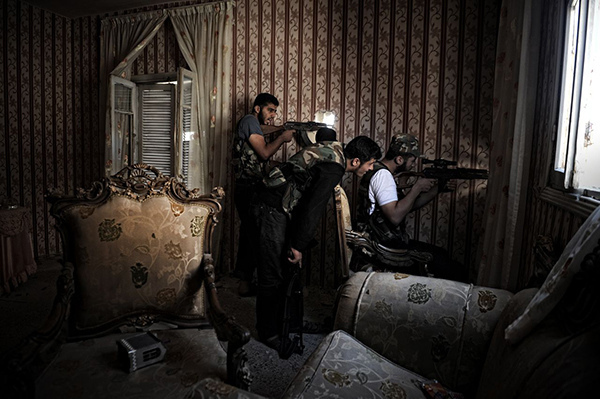 Photo: Syrian snipers by Musa..
Syria denied access to a UN team seeking to investigate chemical weapons use. A new Human Rights Watch report details “deliberate and indiscriminate air strikes on civilians” by the Syrian government. The Al-Nusra Front, a group fighting in Syria, has formally pledged support to Al-Qaeda. Egyptian doctors were ordered to operate on protesters without anesthetic during protests against military rule according to an investigation commissioned by President Morsi. Yemen’s president has ordered a military command shake-up. Saudi Arabia is building a giant fence to seal off its border with Yemen. Two Tuareg prisoners died in detention in Mali after being tortured. 12 people (5 UN peacekeepers, 2 UN staffers, and 5 civilian contractors) were killed in an ambush on a convoy in South Sudan. Obama approved military assistance to Somalia. An Iraqi blogger, “Riverbend,” who documented daily life in Iraq from 2003 to 2007 before going silent after leaving for Syria, posted again with a look back on the ten years of the war. A French photographer, Pierre Borghi, kidnapped four months ago in Kabul, has been freed. A suicide attack in southern Afghanistan killed five, three soldiers and two civilians, one of whom was diplomat Anne Smedinghoff, the first US diplomat to die in Afghanistan since the 1970s. A special ops raid in southern Afghanistan resulted in the death of Khiraullah Janan, a man with family ties to Afghan president Hamid Karzai. Taliban peace envoys were sent to Qatar for negotiations in 2010. They haven’t left (although they are having children). An NPR interview with Afghan photojournalist Farzana Wahidy. A candidate for provincial election in Sindh province, Pakistan, was assassinated, the second such killing during the country’s election campaign. Tirah Valley in Pakistan has become a nexus of violence as the Pakistani army fights Tehreek-i-Taliban and Lashkar-e-Taiba, causing an exodus. Drone strikes are not actually only being used to target senior terrorist leaders, but lesser suspected militants and other unidentified militants within certain areas. Anonymous hacked North Korean social media and networking accounts. Japan set up interceptor missiles in Tokyo as a reaction to tensions on the Korean peninsula. April 10th was the official fifteenth anniversary of the Good Friday agreement, which ended the Troubles in Northern Ireland. Drones will accompany an 8000-strong police force in Northern Ireland to provide security for the upcoming G8 summit. A new round of trials seventy years later may bring some former guards at Auschwitz to justice. A mysterious disappearance of the defense’s legal documents has delayed pretrial hearings for the Guantanamo war crimes trials. Wikileaks published 1.7 million US diplomatic and intelligence records from the 1970s. A judge ruled at a pretrial hearing that Bradley Manning’s prosecutors are required to prove beyond a reasonable doubt that Manning “had reason to believe” that the files he leaked could be harmful. Defense Secretary Hagel has asked Congress to pass legislation that would remove the power of the convening authority to overturn court martial convictions for major crimes like sexual assault. An interview at The Nation with the makers of Invisible War. 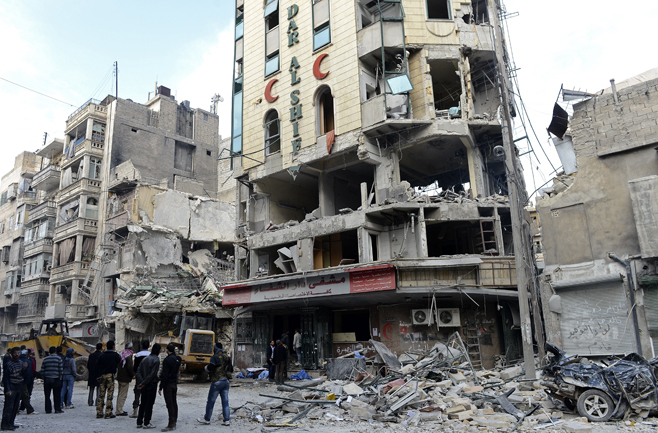 Photo: Syrian opposition fighters and bystanders watch bulldozers clean the debris outside Dar al-Shifa hospital in Aleppo, northern Syria, on November 22, 2012. The Syrian government claimed that the hospital was a “terrorist hideout,” but provided no warning before the attack. The government struck the hospital and immediate vicinity at least eight times. 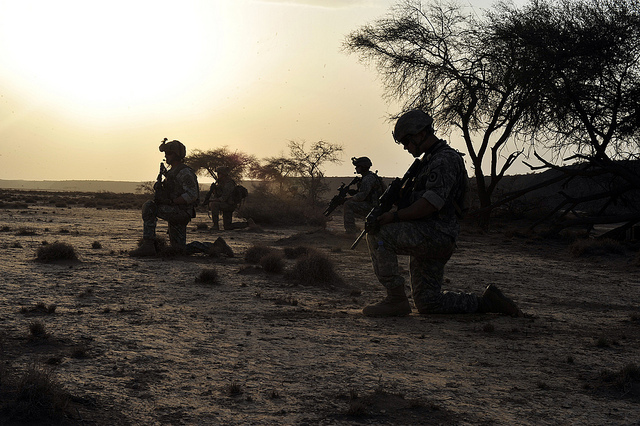 Over the past two years, the Pentagon has become embroiled in conflicts in Libya, Somalia, Mali and central Africa. Meantime, the Air Force is setting up a fourth African drone base, while Navy warships are increasing their missions along the coastlines of East and West Africa. In scope and expense, the U.S. military involvement in Africa still barely registers when compared with its presence in Asia, let alone the Middle East or Afghanistan. On any given day, there are only about 5,000 U.S. troops scattered across all of Africa, while 28,000 are stationed in South Korea alone. But it is becoming more common for the Pentagon to deploy troops to parts of Africa that many Americans would be hard-pressed to locate on a map, such as Djibouti, the Central African Republic and now the West African country of Niger, where the U.S. military is planning a base for Predator drones. Pentagon officials say their expanded involvement in Africa is necessary to combat the spread of al-Qaeda affiliates in North Africa and Somalia and other guerrillas such as Ugandan warlord Joseph Kony and his Lord’s Resistance Army. And while U.S. military leaders have sought to downplay their rudimentary network of bases on the continent, there are signs that they are planning for a much more robust presence.